Great for white fluffy frosting! Try this dual purpose cookware set that doubles as two saucepans or a double boiler. 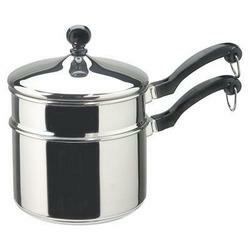 This Farberware Classic 2-Quart Covered Double Boiler Saucepan is attractively styled in stainless steel. The "full cap" base is comprised of aluminum encased in stainless for easy care and good even heat distribution. Oven safe phenolic handles will withstand temperatures of up to 350 degrees. Rolled pan rims provide dripless pouring. Great cook pans for gravies, sauces, frostings, candy, and many more of your favorite recipes. This is a favorite among pan sets for the kitchen. Stainless steel construction Produces attractive and durable pan/pots for the kitchen that are resistant to stains and will not absorb flavors. Encased aluminum pan bottom Provides even and quicker heat distribution. Close fitting lid Provides a self-basting feature when needed so food remains tasty and nutritious. Phenolic handle Is over safe up to 350 degrees. Dishwasher safe Makes clean up fast and easy. Thicker rolled pan rims Achieve drip free pouring and help prevent denting.